Permanent address: 265 Tran Phu, Ward 8, District 5, Ho Chi Minh City. Office: Center for Vietnamese and Southeast Asian Studies, University of Social Sciences and Humanities, Vietnam National University Ho Chi Minh City. Office address: 10-12 Dinh Tien Hoang, District 1, Ho Chi Minh City. 1986: Lecturer at Department of Philosophy and Economics, University of Ho Chi Minh City. 1999: Lecturer of Economic Development at University of Social Sciences and Humanities, Vietnam National University – Ho Chi Minh City. Permanent Lecturer at University of Social Sciences and Humanities, Vietnam National University – Ho Chi Minh City (USSH-VNUHCM). 1980 – 1985: Master of Philosophy and Economics, University of Ho Chi Minh City. 1993 – 1995: Diploma of Management, Innsbruck University, Austria. 1995 – 1998: Ph.D Institute of Economic Theory and Economic Policy, Innsbruck University, Austria. 1990 - 1992: Vice Dean of Philosophy and Economics, University of Ho Chi Minh City. 1999 - April, 2007: Head of International Relations and Research Affairs, University of Social Sciences and Humanities, Vietnam National University – Ho Chi Minh City. 1992, A joint research with Dr. John F. Pierce (University of Washington), assistant of Prof. Roy L. Prosterman, on agrarian reform and private ownership of land in Vietnam. 1996, Seminar Aus Statistik, Prof. Gerhard MARINELL, Innsbruck University, Austria. 1996, Seminar Methodology, Prof. Max PRELAU, Innsbruck University, Austria. 1997, Empirischen Wirtschaftforschung, Prof. Gottfried TAPPEINER, Innsbruck University, Austria. 1998, Doktoratsstudium, VWL Wirtschafttheoretisches Seminar, Prof. John-Ren CHEN Innsbruck University, Austria. 2000-2003, Southeast Asia in Transition. Social Transitions, Environmental Impacts, and Policies for Sustainable Development SEA.trans ICA4 1999-40004. 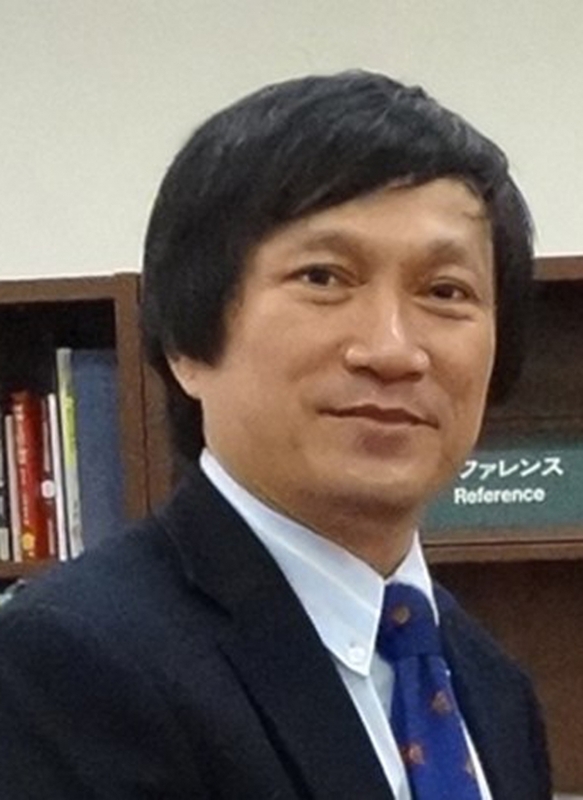 Musical copyrights in Vietnam, a joint research with Prof. Koji Domon (Industrial Organization), Faculty of Social Sciences, Waseda University ( 2008-2009) funded by Okawa Foundation. Human Responsibility & Environmental Change: Planning, Process, and Policy, The XVIIIth International Conference of the Society for Human Ecology. “Introduction of and Exposure to Chemicals in Asian Developing Countries”, a joint research with Prof. Chiho Watanabe, Dept of Human Ecology, Univ Tokyo, Koji Arizono, Kumamoto Pref. Univ. Japan, Masahiro Umezaki, Dept of Human Ecology, Univ Tokyo, Budhi Gnawan, Padjadjaran Univ., Bandung, Oekan, Abdollarh, Padjadjaran Univ., Bandung, Krishna Pahari, Ndri, Kathmandu. April, 2011. 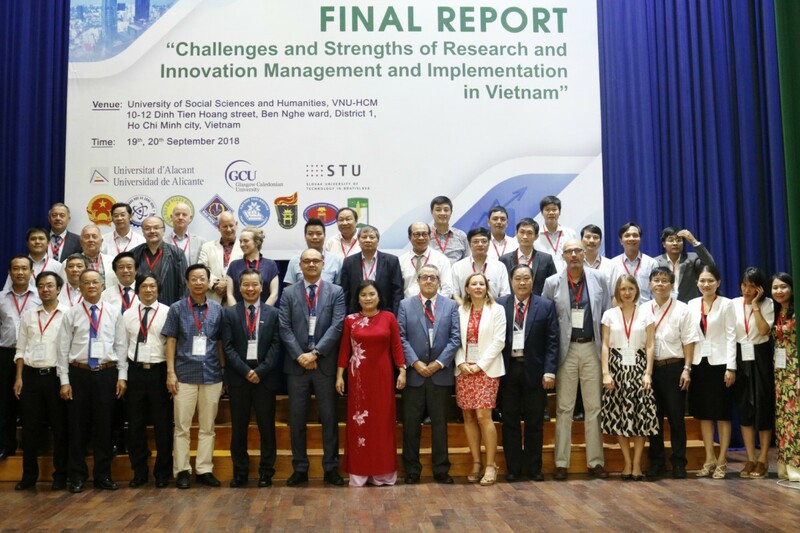 2016-2018, "Strengthening National Research and Innovation Capacities in Vietnam - ENHANCE" Project, sponsored by European Commission and under the leading position of University of Alicante, Spain. 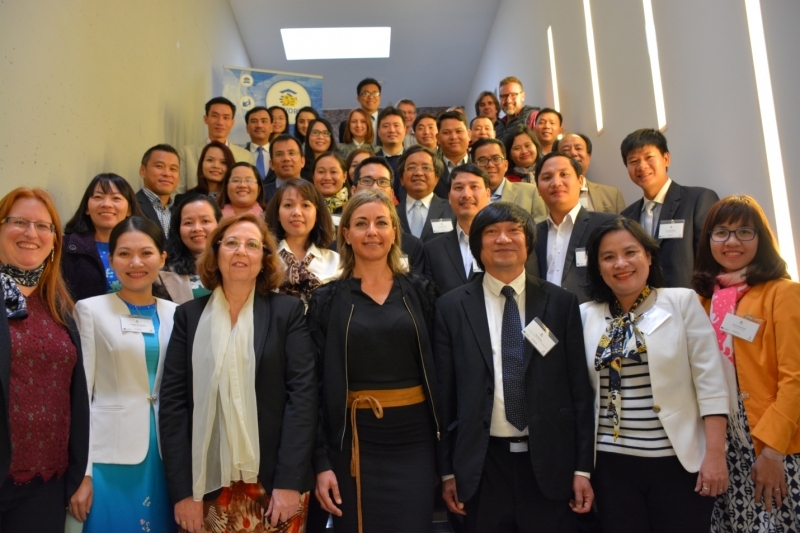 2017-2019, "Strengthening climate change research and innovation capacities in Cambodia, Laos and Vietnam - REACT" Project, sponsored by European Commission and under the leading position of University of Alicante, Spain. Seminar “Vietnam System of Management In the Transitional Period to A Market Economy, 1986 – 1995”, Innsbruck University, Austria. (March 1995). Conference “Europe meet Asia”, Munich, Germany. (June 1996). Seminar “Methodology and its application to the case of Vietnam”, Innsbruck University, Austria (1996). Seminar “The Globalization Period and its Application to Economic Development in Vietnam”, Innsbruck University, Austria. (March 1998). Conference “Vietnam and Asia Crisis”, Lund University, Sweden. (November 1999). Seminar “Social and Economic Structures and the Origins of the Asian Crisis”, Lund University, Sweden. (November 13 – November 16, 1999). Conference “Asian Economie: Reginal and Global Relationship”, Salzburg, Austria. (December 2-9, 2000). Seminar “Conflict Prevention and Solution – Peaceful solutions for complicated issues”, University of Khon Kaen, Thailand (April 2001). Seminar “Trends in Management and Marketing”, University of Songkla, Thailand. (August 2001). Seminar “Economic Cooperation between Vietnam and Republic of Korea”, Sofitel Plaza, HCMC, Vietnam (June 26, 2002). ICU Asian Conference on Service Learning, Japan. (June 30 - July 3, 2002). Seminar “The Role of Agriculture in Vietnam’s Economic Reform”, Institute of Oriental Culture, The University of Tokyo, Japan. (July 4, 2002). Seminar “Transitional Economy and Social Change”, Asia Japan Research Center, Kokushikan University, Japan. (July 26-30, 2002). International seminar “Location and Attractiveness Studies in Tourism: Supporting Tools for Tourism Policies”, Chulalongkorn University, Thailand (December 1-3, 2003). Conference “Policy and Planning of Tourism Industry in Asian Countries”, Bangkok, Thailand (June 7-8, 2004). Conference “Continuity and Change in Historical Experience of Vietnam and Republic of Korea”, Busan, Republic of Korea. (October 29-30, 2004). Seminar “Economic Development and Poverty Alleviation in Vietnam: The Role of Education”, Journal of Tokyo University of Information Sciences, Japan. (February 2005). Seminar “Vietnam’s Economic renovation: Information Technology as the power”, Kitakiushu University and Waseda University, Japan (February 2, 2006). Seminar “Changing Thoughts in Teaching Economic Development at University of Social Sciences and Humanities”, Pukyoung National University, Republic of Korea. (September 28, 2006). Seminar “Economic Renovation in Vietnam”, Keio University, Japan. (October 3, 2006). Seminar “Further Development of Republic of Korea - Vietnam Cooperation and Exchanges in Economic, Tourism and Education”, Busan National University, Republic of Korea. (October 26, 2007). Seminar “Vietnam’s economic Reform” Faculty of Social Economics, Waseda University, (November 2007). Conference on "Economic cooperation and environment in Singapore" organized by EU Center in Singapore and Asia-Europe Foundation with the partners of Mercury and East Asia Net, December 6-8, 2009.
International Conference on “The Construction of communities of Asia” funded by The Asian Culture Exchange Foundation, May 15-16, 2010. Seminar with the Students of the Faculty of Industry at Waseda University, Japan, May 19, 2010. Workshop on Education and Research Collaboration in Indochina Region held by School of Global Environmental Studies, Kyoto University., May 21-24, 2010. Workshop “Outer Civilizations and Infra-Culture of Southeast Asia” International Conference of ISEA- Pusan University of Foreign Studies, Korea , June 2-3, 2011.
International Workshop on Sustainable Tourism: “Promoting a Sustainable Ecotourism in Vietnam” organized by the University of Trento, Erasmus Mundus Program, Phnom Penh, Cambodia, September 17, 2012. Seminar titled “Interdisciplinary study on poverty based on capability approach” held by University of Tokyo, Japan, from 22-27 November, 2012. Workshop on “Relationship between politics and economic renovation in Vietnam” at the Department of Political Science, Seoul National University, South Korea on December 03, 2012. Workshop on “Economic Reform in Vietnam” at the Josai International University (JIU), Tokyo, Japan on November 29, 2012. Conference in the frame of the project “Promoting the international dimension of research in HEIs” organized by the University of Free State (South Africa) in coordination with the University of Alicante (Spain) from 14-17 January, 2013. Conference “From CLMVT to AEC: Current Situation and Future Prospects” held in Khon Kaen, Thailand on June 13, 2013. The “Global SAEMAUL Forum 2013” at the Yeungnam University, Korea on 26-27 June, 2013.
International Conference “Engaging With Vietnam - An Interdisciplinary Dialogue”, Thai Nguyen University, 16-17 December, 2013. Seminar on “Interdisciplinary study on approach based on capability approach” at Tokyo University, Japan on March 8, 2014. Seminar on “North East India in India's Look East Policy” at Manipur University, India on March 17, 2014. Conference on “Sustainable Development and Ethnic Minority Poverty Reduction in Mountainous Regions” at Thai Nguyen University on June 12-14, 2014.
International Conference on “Intellectual property management” heip-link at Ho Chi Minh on Sept 11,2014 Conference on “the Help-Link Project" at the Jagiellonian University, Krakow (Poland) on October 26-27, 2014. Conference on "Prospects for Forming Mekong Business Area: Thai Plus One Corporate Strategy and Its Supporting Policies" at Jetro, Bangkok on Sept 15,2014. Conference on “Vietnam’s critical issues” at the University of Oregon (the U.S.) on November 6-7, 2014. Conference on “Thai plus one” in Thailand on January 12, 2015. Conference on “Regional Characteristics of Southeast Asia and Its Comparison with Others” and “Approaches to Southeast Asian Studies: Methodological Quests” at Busan University of Foreign Studies (BUFS), from 23-25 April, 2015. Talk on "Vietnam's Economic Reform: 1986 - 2016", on February 2, 2016, held by the Center for Southeast Asian Studies at the University of Hawaii at Manoa. Seminar on "30 years of Economic Reform in Vietnam" on June 21, 2016, held by East-West Center, Honolulu, Hawaii, USA. Seminar on "Environmentally and Socially responsible Tourism Capacity Development Program" funded by European Union, held in Hanoi from August 13-22, 2014. Conference on ““Regional & national approaches toward the sustainable development goals in Southeast Asia and Asean” held by Faculty of Social and Political Sciences, ASEAN Studies Centre of Gadjah Mada University and Groningen Research Centre for Southeast Asia and ASEAN of University of Groningen at Yogyakarta, Indonesia, on October 3-5, 2017. Training workshop of REACT Project on “Research & Innovation Support Services”, on 30th October - 1st November, 2017, hosted by Souphanouvong University, Laos. Seminar on “The trends of Vietnam Studies and the current situation of Vietnam-China & Vietnam-Taiwan relations”, held by Department of Southeast Asian Studies and Center for Southeast Asian Studies at National Chinan University, Taiwan, on June 20, 2018. Seminar on “The Rise of China”, held by Institute of International Politics at National Chung Hsing University, Taiwan, on June 19, 2018. Discussion “Economic reform and Sustainable Development in Vietnam” at Royal University of Agriculture, Cambodia, on July 13, 2018. Traning workshop of REACT Project on "Financing Climate Change Activities in Higher Education Institutions", co-organized by Royal University of Agriculture (Cambodia) and University of Alicante (Spain), in Cambodia, on July 9-12, 2018. “Trung Nguyen Coffee in the center of Tokyo” Saigon Time Weekly, Edition 34th, August17, 2002. “Pondering on a memorable trip” Saigon Times Weekly, Edition 52th, December 18, 2003. “Solidarity and Determination needed”, Saigon Times Weekly, May 27, 2004. ‘Humanity from the generous heart’, Saigon Times, Edition 8th, 19 February, 2004. “How education should be renovated?” Saigon Times Weekly, Edition 16th, April 16, 2004. “A desirable harmony between economic development and cultural values’, Saigon Times Weekly, Edition 36th, 2nd September, 2004. “Vietnam lovers in Republic of Korea”, Saigon Times Weekly, December 2, 2004. ‘Thailand promoting education’, Saigon Times Weekly, Edition 11th, March 10, 2005. “India: Education for a quality life” Life Science, July 18, 2005. “An Overview of Vietnam 1985 - 2005 Economy”, Arts & Literature Publishing House, 2006. “The power from research works” Labourers Newspapers, November 29, 2007. “Scholars advocate knowledge sharing at Rome conference” The Saigon Times Daily No.3260 August 25, 2008. Thanh Phan, Tran Dinh Lam, Van mon “The Economic, Cultural and Social Life of Bahnar People Sustainable Development”, 2011, Vietnam National University - Ho Chi Minh City Publishing House. “Intellectual Property Rights in Developing Countries”, Conference Proceedings edited by Koji Domon, Tran Dinh Lam and Simrit Kaur and sponsored by Waseda University, Japan; Vietnam National University - Ho Chi Minh City Publishing House, 2012. Doan Cam Thi, Xavier Guillaume, Huynh Nhu Phuong, Philippe Langlet, Le Thi Xuyen, Nguyen Hoang Trung, Nguyen Thi Hiep, Emmanuelle Paquet, Phan Thanh Thuy, Emmanuel Poisson, Marina Prévot, Anne-Sophine Vo-Paillaud, Tran Dinh Lam, “Cahiers d’études vietnamiennes” (ISSN – France: 0224-2958), Vietnam National University - Ho Chi Minh City Publishing House, 8/2013. Yukio Ikemoto, Koji Domon, Tran Dinh Lam, “Small and Medium-sized Enterprises: Way to Success”, 6/2014, Vietnam National University - Ho Chi Minh City Publishing House. 2017, So Umezaki - Chap Sotharith - Vanthana Nolintha - Aung Min - Tran Dinh Lam, Chapter 5: "Cambodia-Laos-Myanmar-Vietnam: Thaland Plus One's Investment in Countries" in THAILAND PLUS ONE CORPORATE STRATEGY, Vol. 6, ERIA-TCER.